Easy to use test strips to measure protection against liner pitting, corrosion and coolant dilution. Easy to Use Test Strips to measure for overall coolant quality. Easy to Use Test Strips to Determine if Coolant Make-Up Water Meets OEM, TMC and ASTM Specifications. Determines the Freeze Point Protection for Ethylene Glycol and Propylene Glycol Coolants. 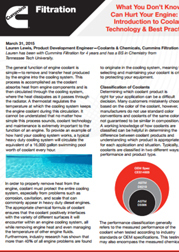 Cummins Filtration also offers professional laboratory fluid testing for fuel, oil, hydraulic and transmission fluids. Click here to learn more.